The S40 and V40 have been very successful for Volvo, with the T4 being a sporty addition to the model line up, yet more proof that Volvo has changed its image from being a manufacturer of staid boxy sluggish estates. The S40 is of course also receiving additional exposure due to the fact that there are currently two being raced in the British Touring car Championships. 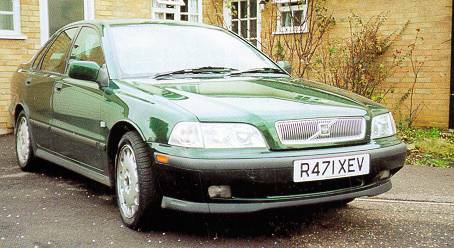 On collecting the car from Matthams, if appeared very similar to a 'standard' S40, With the exception of The rather striking alley wheels. and discreet T4 badge on the rear - I was informed afterwards that as if was one of the very first it did not have the standard rear spoiler fitted. The car supplied was, as expected fitted with all the standard luxuries, namely air-conditioning, leather upholstery, and the digital information centre supplying various temperatures, fuel economy, range and average speed. All the range has the option of the firmer up-rated sports suspension, whereas all T4's have it fitted as standard. The roadholding of The S/V40's has always been superb in my opinion - the increase in firmness of the T4 improves this even further. Regrettably, the two days I had the vehicle, the English weather decided to rain consistently, providing a nice greasy slippery surface for me to slide all over! The T4's wide low profile tyres coped exceedingly well, providing a high degree of grip and traction in the poor conditions. Performance was as expected, very quick, with a very smooth turbo action. Throughout the two days, very little of my driving was on anything other carriageway roads. I am certain the that would have produced its incredibly high top speed if required, however for the majority of the time it was driven at well under the legal limit. Driving down familiar roads, notorious for their slow moving traffic was made considerably easier by the very rapid acceleration, which allowed for prompt safe overtakes with a minimal amount of time being spent on the opposite side of the road. Used correctly, I am convinced that performance vehicles are considerably safer, and in the case of the T4, coupled with air bags, SIPS, and all the other Volvo safety features, the T4 is a very safe vehicle indeed. Having driven into London, and making my way home through heavy rush hour traffic, I was curious as to what fuel economy could he obtained in such urban situations. To my extreme surprise, driving gently, although not slowly, the return was approximately 35 mpg, as opposed to the 26 - 27 mpg achieved earlier on driving a little harder on open roads. Considering the size and performance of the car I consider this to be very reasonable. The T4 is available in various trim levels, with a starting price of just over £20,000, which increases according to what extras are fitted. Much as I still am very fond of my 480, the technological advances over the last ten years put the S/V 40 series into a completely different class.